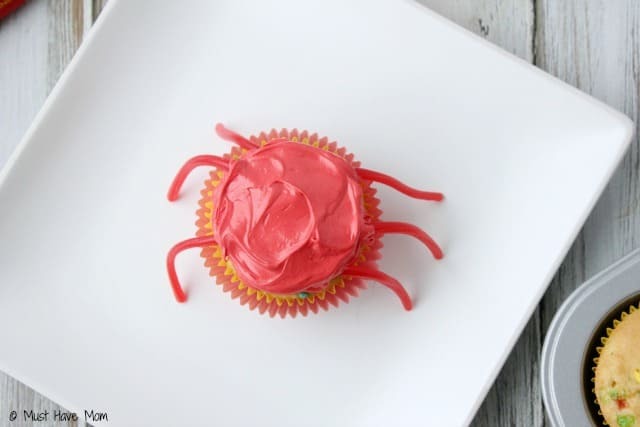 I made these adorable crab cupcakes to celebrate the end of the school year and the kickoff to Summer vacation! What could be more appropriate than crab themed cupcakes to celebrate the upcoming warm weather and trips to the beach? I am so excited for Summer and I’m thrilled to have my kids on Summer vacation! Bring on the sun! 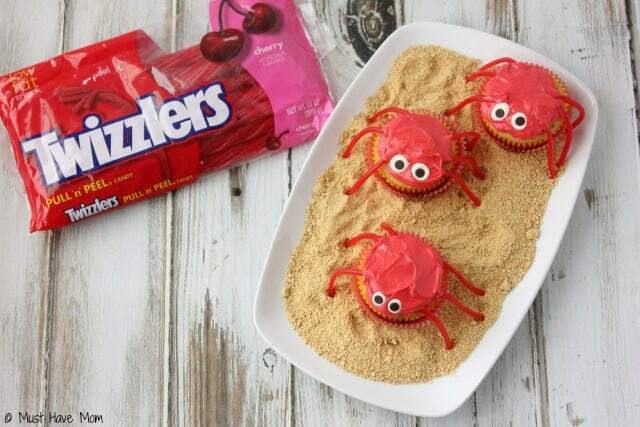 To create these easy crab cupcakes you’ll need Twizzlers PULL ‘n’ PEEL licorice, Hershey’s mini chips, frosting (I just used store bought but feel free to make homemade), red no taste gel food color, graham cracker crumbs and cupcakes (I made a box mix). 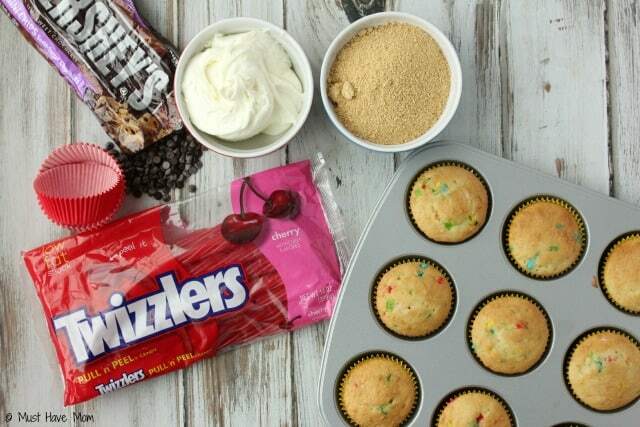 To start place your cupcake in a red cupcake liner. Then cut your Twizzlers PULL ‘n’ PEEL licorice into “leg” sized pieces. Insert them into your cupcake so they are touching the plate. You want them to have a little bend in them so they look like they are walking. Next dye your frosting using your red gel food color until you have achieved a red color. Be sure to set aside some white frosting to use for the eyes. 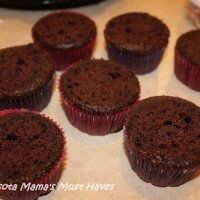 Then spread the red frosting over the top of the cupcake, covering the licorice. Next put some white frosting in a piping bag or a zip top bag with the corner cut off and then pipe on two eyes for each cupcake. Now push two Hershey’s mini chips into the white frosting to complete the eyes. Then pour graham cracker crumbs on a tray to serve as your “sand”. If you don’t have graham cracker crumbs you can also use brown sugar. I also added some real seashells for added effect! They turned out so cute and the kids absolutely loved them! It was the perfect way to get in the mood for Summer! Need more inspiration for fun Summer activities and recipes? Hershey wants to help inspire you too so they have created a site devoted to crafts and recipes that you can create with your children! Visit Celebrate With Hershey’s to see all their fun ideas! Pin this post and share it on Facebook for easy finding later! This is such a great idea! I’ve pinned this for later. These are absolutely adorable and perfect for our Maryland summer parties! Visiting from i should be mopping the floors and pinning. Have a happy Monday and a great week! I love these SO Much! OMG they are so adorable. Extreme edible cuteness!!! I invite you to share at my Thursday hop. You can link up from Weds night 7PM MST to Sat midnight) Hugs! Sarah, these are so adorable that they made me smile! 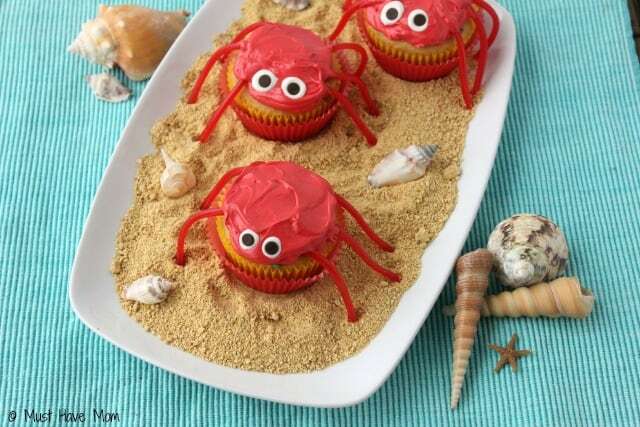 Ok, those are the cutest little crab cupcakes I’ve ever seen! And my kids absolutely adore Twizzlers Pull n peal! 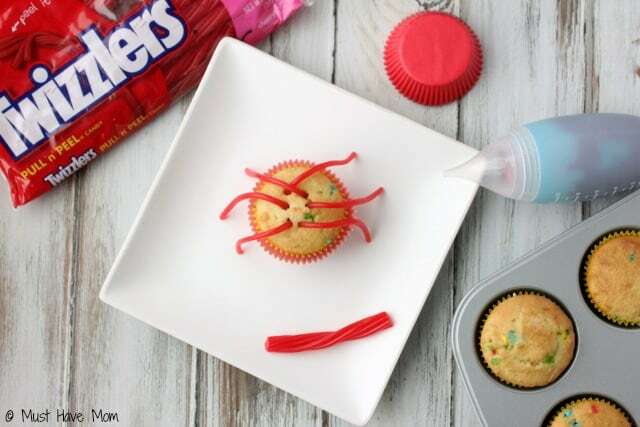 What a creative cupcake idea. Definitely have to save these instructions for when I have grandchildren. This is the best crab cake I’ve ever seen! Those look fantastic! 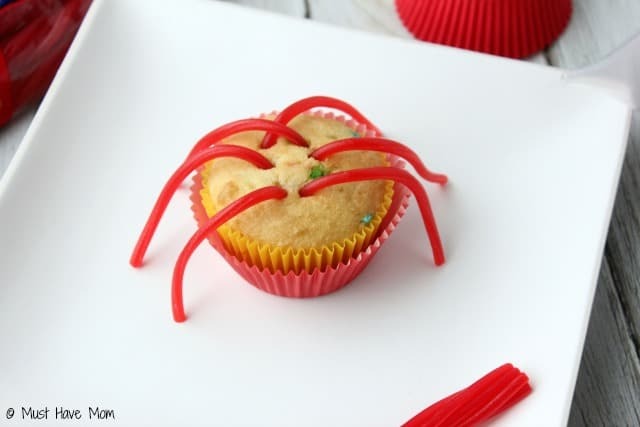 What a cute and simple cupcake that even kids can make. These would make great summertime cakes! Awww, these are adorable! What a fun dessert. Could these be any more adorable?! It just so happens my oldest will be having a sea creature themed birthday party next weekend and this would be a great hands-on activity for the kids. These are super cute! I know my kiddos would love to eat them up! These are so adorable!! 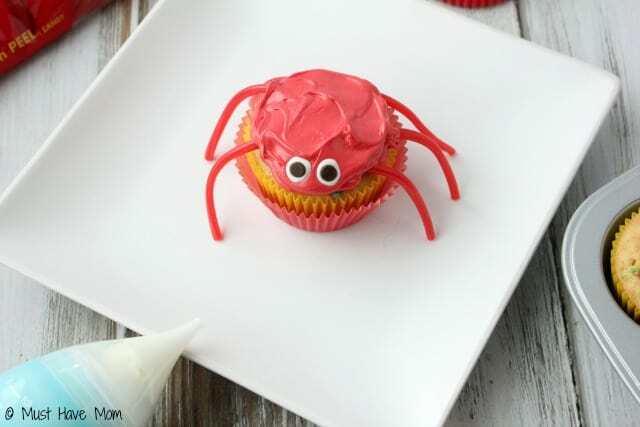 My birthday is in July and my sign is Cancer the crab, so I should make these for myself! This is such a cute cup cake idea. My sister is a June baby so this would be perfect for her birthday. I love these cup cakes. I am going to have to try making these. I hope they turn out as good as yours. These are adorable cup cakes. I will have to remember these for my next BBQ. oh my gosh those are so cute! They would be fun to make during the summer as a fun treat. Haha, I knew those were Twizzlers as soon as I saw them! These are so adorable- great for our ocean themed ‘unbirthday’ party each year! Soooo cute! Love these! What a perfect treat for a pool or beach party! Thank you for sharing with us at Brag About It! 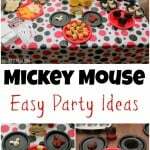 My gosh – this is so cute – I wish we had known about this idea when I was a Conference Center Exec – this is great for a kids group – and I would have enjoyed tasting it and watching others ooh and ahh over it! 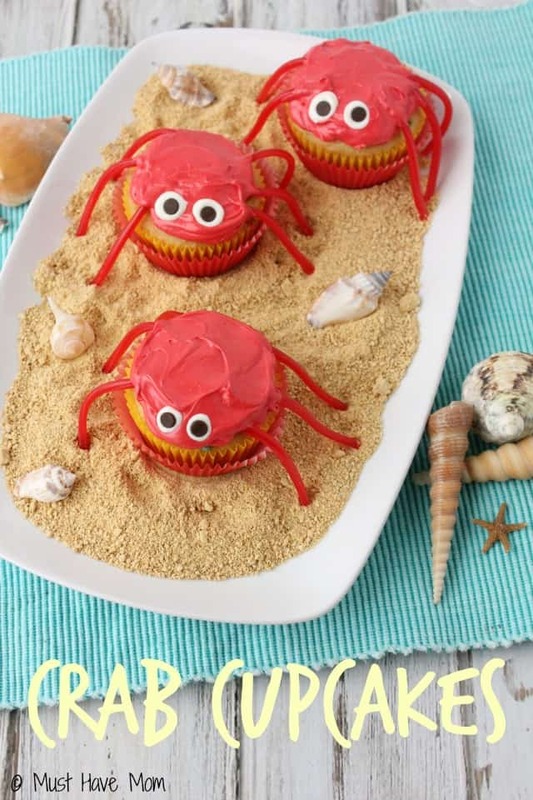 These are so cute & would have been perfect for my girls beach party themed birthday party! These are adorable! How festive! These are to adorable. I can see making these for a pool party. Thanks for linking up this week on the #HomeMattersParty. Hope you will come back and link up again next week. 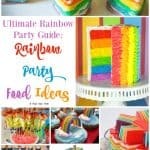 This recipe is so cute and really creative! These are such cute cupcakes! So perfect for a beach party theme. These cupcakes are so adorable and fun to make. 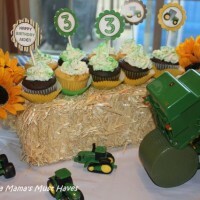 I know that my niece and nephew would have fun making these cupcakes and more fun eating them. Thanks for the recipe! Wow! These are just the cutest! 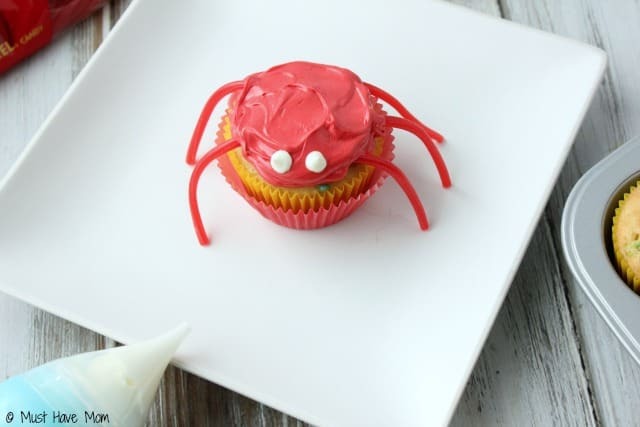 These crabs(a.k.a crab cupcakes) are adorable. Thank you for sharing it with us @ #HomeMattersParty. We would love to have you again next week. Oh my gosh, these are the cutest ever. Thank you !